We're getting the attention of the world. When organizations attempt to define and mitigate risks, they face several types of difficult problems, the most obvious of which involve technical issues. When the Chernobyl plant nearly destroyed itself, for example, the world's attention was riveted on Soviet efforts to contain radioactive fallout and extinguish the burning reactor core. After the catastrophic chemical leak in Bhopal, enormous effort was expended to understand the plant's technological failures and recovery devices. In the Binghamton case, the accident also created a set of important technical problems, chiefly that of ridding the State Office Building of toxic chemicals. As important as technical problems are, however, they are not as difficult as some less obvious social problems. For instance, who should define safety levels, who will create policy, and who will be legally accountable for exposure? Although these issues may appear fairly unproblematic, a closer look reveals some interesting ambiguities in defining exactly how they are resolved. That is our task in this chapter. Binghamton's banks and government are located downtown, so many people go there frequently. But it is odd for the accustomed focus of human activity—downtown—to suddenly be a place that people cannot enter because of a cancer risk. The SOB is ten stories higher than any other building in the area, standing as both a question mark and a potential health hazard. As was true for medical surveillance, the task of rehabilitating the SOB has proved formidable. By July 1988, about $30 million had been spent on several cleanups of the building. In contrast to the difficulties involved in the medical surveillance, however, it has been easier to measure the effects of those ameliorative efforts. Interestingly, the techniques that organizations used to make sense of the ambiguities involved in decontaminating the building were similar to the techniques used in medical surveillance. Levels of chemical concentrations were an important part of defining the severity of the problem within the SOB, and thus of measuring the effectiveness of attempts to certify its safety. Acceptable risk, political choices, and solutions to technical and social problems have all been couched in terms of these chemical levels. Two technical points need some explanation. First, the chemicals of concern to those deciding the fate of the SOB, and to the people who will most likely work there, were PCBs, furans, and dioxins; excluded from testing and measurements of cleanup progress were other chemicals such as 2,3,6,7 tetrachlorobiphenylene, although there is evidence that these toxins are as dangerous as dioxins (Stalling, March 31, 1981). Second, chemical concentrations were measured both in the building's air and on its surfaces. Toxic air levels are expressed as the ratio of mass per cubic meter (usually in micro, nano, or picograms/m3). Some surface samples from the building were gathered with swabs, usually expressed as the ratio of grams per square meter (ug/m2; ug = micrograms); some were collected in bulk and expressed as a proportion of the sample from which they were taken, usually in parts per million or billion (ppm or ppb) or sometimes as the proportion of chemical to soot weight (i.e., as percentages). The New York Department of Health reported some precleanup PCB levels, but we need not dwell on these numbers, for there is no way of knowing how accurately they reflected the distribution of contamination within the building. 1 An extremely wide variation in the amount of toxins was found among different samples, as low as nondetectable levels of PCBs in the air two weeks after the accident, and less than .1 ug/m2 on surfaces (averages and some of the highest levels are given in note 1). One test for furan was as low as 5.4 ug/g (Stalling, March 31, 1981), and dioxins were measured at levels as low as 1.2 ppm. Even though officials often used averages in public meetings, press conferences, and risk assessments, the meaning of those averages is especially ambiguous. For example, it is difficult to interpret the 1.48 ug/m3 PCB air-sample average because we do not know if the samples were taken when the air was circulating. The difference air circulation makes is illustrated by comparing two samples taken from the Binghamton City Hall. Before the air conditioning was turned on, PCB was detected at 6.8 ug/m3; after the air was circulated, PCB was detected at 12 ug/m3 (Hawley to Kim, May 1, 1981). Similar increases in surface-level PCBs were reported by DOH in the State Office Building. Moreover, there is little reason to believe that the pattern of chemical distribution within the SOB was random. Thus, without comprehensive sampling it is difficult to interpret the meaning of any of the average toxic levels, or even the maximum levels. Nevertheless, I report the figures because they were the ones most often referred to by the New York Health Department and the Office of General Services in documents and public statements issued to experts and the public. More important, these measurements were the only way to gauge the progress of decontamination. Dioxin was detected in the soil around Seveso at .03 ppm. One DOH scientist compared the levels of dioxin in the SOB to those discovered at Seveso: "We're talking the same ball park of contamination as Seveso.... We don't know the exact calculation of how much material was released into the building yet, but we think it's similar" (Fecteau 1981f). The director of public health for DOH also compared the chemical levels at the State Office Building with those at Seveso (Fecteau 1981f). The levels of PCB, furan, and dioxin were too high to be background contaminants. But the problem was not so much that chemical levels were too high, but that there was no way to know what levels would be low enough to allow reoccupation of the building. An engineer for OGS said soon after the accident, "We are writing the book here. This is unknown." We will now turn to the question of how, and why, that "book" was written. The technical problems posed by the toxic chemicals were indeed difficult. The State of New York (and its consultant, VERSAR, Inc.—discussed below) developed cleanup technologies for which there were few precedents. Yet the technical problems were not insurmountable, for their solutions could at least be based on techniques developed for other situations of chemical contamination. The social problems, however, were another matter. The most important barrier to cleaning up the building was dissension between those who claimed authority to decide what constituted reasonable danger. The Office of General Services could have removed the last traces of toxic chemicals (at least to levels of nondetection), scraping the walls, floors, and ceilings and burying the building's contents, but the task of creating a structure of responsibility and norms of acceptable risk would still remain. From the view of the state, competing claims to participate in key decisions precluded such consensus. The deputy commissioner of OGS conceded: "If we clean and then say, 'Okay, it's clean,' and the public has no confidence in us, then the building isn't clean" (Hudacs interview, October 8, 1981). Joseph Gusfield (1981) persuasively argues that the relative abilities of social actors to establish themselves as the "owners" of risk are important parts of the process of constructing solutions to public problems. In the Binghamton case, this means tracing the process of distributing responsibility among organizations, making some solutions more likely to be pursued than others. Thus, to anticipate my conclusion, once the Office of General Services "owned" the problem of the SOB's risk, it was not likely that the alternative of destroying the building would be publicly considered. 2 Earlier, ownership of risk was not as clear. For example, after the first (janitorial) cleanup there were extensive charges from various groups that OGS (and New York State more generally) faced a conflict of interest. How, some wondered, could an agency be trusted to define adequate cleanup procedures while being held legally liable for the failure of those procedures? Others complained that OGS lacked the expertise to tackle the problems. A clear structure of authority was needed, one that established rights to make decisions and access to organizational resources. These efforts to establish legitimacy were contested, however. Officials in Binghamton complained that the expert panel was not being convened in their area. The county executive and the Binghamton mayor, for example, argued that because the SOB was in their community, local officials ought to have access to those who might define acceptable risk for their constituents. Some of these officials, in addition to the local press, asked that the meeting be held in Binghamton. But Axelrod argued that the panel's discussions would be too technical for the general public. Once a decision had been reached on the goals and methods of the cleanup, he said, state officials would express them in terms laypersons could understand (Fecteau 1981i). What level of exposure to the various chemicals ... is permissible? What kind of testing should be done to monitor ... any decontamination effort? As Axelrod claimed, these questions involved highly technical issues. For example, toxicology, animal testing, limits of detection, and threshold values for the induction of cancer were all discussed in detail. Major Young prescribed other public relations devices that would help create a less gloomy impression of toxic contamination. He suggested that establishing a more or less permanent "Binghamton Authority" in Binghamton would send a clear message to the press and the public that the SOB was being taken seriously by state decision makers, and he also suggested that strict control be instituted over the dissemination of technical and political information. The major knew what he was talking about. He had been heavily involved in Agent Orange studies that many took to refute the hypothesis that exposure to the defoliant placed soldiers at inordinate risk (cf. Smith 1985). State officials followed the spirit, if not the letter, of Young's advice. Although the experts did not answer the questions put to them, convening the panel nevertheless had potential as a solution to the state's problem. One interpretation of the panel's purpose, the one espoused by state officials, was that the gathering of experts was an attempt to amass a wide array of information and to generate alternative answers to problems of cleanup and medical surveillance. As most theories of decision making would have it, the best way to arrive at an optimal solution is to create conditions that foster serious consideration of a wide range of alternatives, each of which has some credibility and some potential for implementation. But was this a valid description of the panel's operation? Two observations suggest that the official version of the panel's purpose and operation was not altogether useful. First, those chosen to serve on the committee did not represent a wide variation in opinion. DOH and OGS solicited opinions only from experts they considered legitimate. Had the panel included exposed workers, citizens of Binghamton, and County Health Director Schecter, more serious criticisms would have been likely. The state's refusal to hold the meeting in Binghamton also served to stifle potential dissent, and therefore alternatives. There can be little doubt that the conviction to reopen the building, rather than destroy it (as some officials and Binghamtonians were suggesting), would have been criticized more if the panel had met in Binghamton rather than two hundred miles away in New York City. Second, and more important, is that the panel's agenda was structured to preclude certain options. Officials making decisions regarding risk frequently complain about the hazards of information that is misinterpreted because it is released to the press and the public outside its proper context. For example, fifty thousand people die on U.S. highways every year (almost as many as were killed in the Vietnam War). This grim statistic tells the risk of motoring only in absolute terms. To understand how grim the number is, it must be made relative to some comparison point, for example, to the number of miles driven every year or, better yet, to the number of miles traveled per hour of exposure. These ratios are an important aspect of the context of the risk of driving because they allow comparisons with the risks of other activities. We can understand still more about the risks posed by the highway system if the death rate on highways is compared to the death rates of alternative ways of moving large numbers of people. Similarly, OGS and DOH officials frequently complained that the media (and those considered alarmists) too often drew attention to PCB levels within the SOB without also noting that PCBs are ubiquitous in the environment, that fluorescent light fixtures and refrigerators (whose capacitors often contain the chemical) contaminate us daily, and that benefits accompany the risks of using PCBs. Although it was not his intent, the governor reminded everyone that absolute safety was an unreasonable goal when he announced at a press conference that "there's no such thing as a risk-free existence, as long as we have a free press" (Geimann 1981b). The governor's remarks angered nearly everyone. Negative public opinion was expressed in letters to newspapers and in my interviews in Binghamton. The media added the governor's comments to a long list of what they deemed his frivolous behaviors (such as dyeing his hair orange). Local officials, and labor unions, interpreted them as evidence that he did not take their problems seriously. The governor's own commissioners of health, general services, and environmental conservation were suddenly in situations similar to ones at Love Canal. Carey's threat may have been idle, and his contention that decontamination would be easy unreflective, but his implication was certainly correct: Decisions regarding hazards reflect distributions of power, as some groups allocate hazard and others bear those allocations. Moreover, the governor was explicitly stating some assumptions that are often hidden in the arcane discussions of experts: Threats to public health are also threats to other social resources. The nearly $30 million spent cleaning the SOB suggests that the building was a risk not only to the health of those who entered it (and those who will, most likely, enter it again) but also to the organizations that constitute the State of New York. If risk is a relative concept, then it is also appropriate to ask whose risks were being ameliorated with the OGS's cleanup, and what, exactly, were the risks being mitigated? Underlying the complaint about risk assessments being interpreted out of context is the presumption that people make decisions and evaluate threats to values on the basis of information. If the databases of decision makers are systematically biased, however, then it stands to reason that their judgments will also be biased. It is important, then, to consider some of the information that helped form the context for the expert panel. The panel was given a packet of materials that established the premises of the alternatives it considered. Among the materials were, as I indicated, several questions that, it was hoped, the experts would answer. Also enclosed was a short description of the fire, an account of the first cleanup (the janitors were not mentioned), and an explanation about how the discovery of dioxins and furans led officials to close the building. Also included was a "sampling plan" that described how samples of soot were taken from the building and claimed that the geometric mean on surface levels decreased nearly 700 percent after "an initial surface cleaning on the seventeenth floor." Next in the packet were four tables showing PCB measurements. The first table showed PCB levels inside the building, and the others documented levels taken from control locations, including the SOB's basement, the County Office Building, and the garage of a local bank. All of the control levels were much lower than those in the first table. Also included in the packet was a report from the New York Health Department, dated February 20, 1981, entitled "Analysis of 2,3,7,8 Tetrachlorodibenzofuran and 2,3,7,8 Tetrachlorodibenzo-p-dioxin in a Soot Sample from a Transformer Explosion in Binghamton, New York" (Smith et al., February 20, 1981). This paper was also put in several Binghamton libraries. A breathless, highly technical analysis, the paper reports the 2.9 ppm of dioxin and 273 ppm of furan that state officials most often quoted. It closes with a discussion of DOH's method of detecting dioxins in the soot, a description that, as Axelrod claimed, would indeed have been opaque to a layperson. There are several things to note about this packet. First, the meaning of the average chemical levels the panel was to consider was more ambiguous than their contexts suggested. Second, the highest level reported for samples taken from the garage was 51 ug/m2, although another DOH analysis, dated March 12, 1981—three weeks before the panel first met—reported the concentration to be 240 ug/m2 (Hawley to Kim, May 1, 1981). Third, all the surface samples were collected using "dry wipes." Hexane wipes, however, almost always yield higher levels than dry wipes. It is difficult to be confident that the panel based its discussions on the best information available at the time. In the extra material, chemical levels in the SOB are first compared to "Yusho," an incident in which a thousand Japanese ingested rice oil contaminated with PCBs, as well as with the more toxic furans. "The most common manifestation of disease was a swelling of the eyelids followed by acneform eruptions [i.e., resembling acne] and skin pigmentation." Other symptoms included "nausea, headaches, jaundice, and neurological disorders." The paper then estimates that someone need ingest only 12 milligrams of the contaminated soot particles "to reach 1 percent of the [furan] dose that proved toxic to the Yusho victims." The unedited paper also describes three other incidents of dioxin exposure. It tells how in 1971 three horse arenas in Missouri were sprayed with a dust-control oil that had been accidentally contaminated with dioxin: "Over a period of 3 years approximately 70 horses who were exercised in the arenas died. Two adults and four children developed chloracne of varying severity after exposure to the soil. One of the children, a 6 year old girl, who played regularly in the most heavily contaminated area, developed more serious medical problems including hemorrhagic cystitis and focal polynephritis." 5 The little girl's playground was contaminated with about 33 ppm TCDD (dioxin). Dioxins in the State Office Building were detected at levels as least as high as 24 ppm (Smith et al., February 20, 1981). The dioxin contamination of the SOB soot was also compared to dioxin levels discovered at Love Canal, where "certain medical problems including reproductive failures have been reported for people who lived near the dumpsite." The final comparison is to the Seveso incident, where "the only established medical problem in the human population has been the occurrence of chloracne among approximately 180 people, mainly children." 6 This last section of the report is careful to point out that the situations are not "directly analogous," although it concludes with the information presented here in table 5. SOURCE: Smith et al. 1981. The Binghamton case is indeed not "directly analogous" to other instances of dioxin contamination, mainly because of the difference between the types of samples and because most of the Binghamton toxins were kept inside the SOB. The data also suggest that the State Office Building was more dangerous, at least in terms of acute exposure, than either Love Canal or Seveso (see table 5). It is true, as experts and officials say, that contexts are important for making sense of pieces of information. Contexts are particularly important for decision makers because they place an alternative within a range of choices and thus permit them to choose a solution they deem most reasonable. At least two possible contexts were suggested in the DOH report, each created by a different "vocabulary" of risk. One uses the vocabulary of acceptable daily intakes, geometric means of micrograms per square meters, bioassays, chromatography, and reproductive failures. When OGS placed several reams of documents on file in Binghamton's libraries for public inspection, most of them bore titles (which accurately reflected their contents) such as "Engineering Report on Air Filtration and Pollution Control System for the State Office Building in Binghamton, New York." Missing from those documents, however, were the terms of another, complementary, vocabulary of dead horses, swollen eyelids, and children with dread diseases. The consequences of creating a context for making decisions about acceptable risk are clearly important. Some contexts draw attention away from certain potential effects of toxic chemical exposure and turn the spotlight toward others. Risk can be characterized in a way that is directly accessible to the public and the media, as well as to experts. Such characterization leaves little doubt about the effects that dioxins, PCBs, and furans can have on human health. Another kind of characterization is remote from human experience and is therefore less easily understood and criticized by groups lacking technical training. 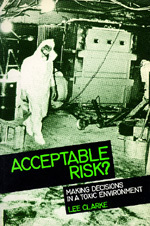 In June 1981, about four months after the accident, the Office of General Services contracted with VERSAR, Inc., an engineering firm specializing in the study and control of hazardous materials, to assume broad control of cleanup. One of VERSAR's first tasks was to find a way to vent the State Office Building. In the process of decontaminating the building, dust and soot would be stirred around and some of the chemicals would vaporize. Also, because the toxins were distributed throughout the building via the ventilation system, the air ducts and plena contained the largest amounts of contaminants. A cleanup that did not include circulating the air in the building would therefore be incomplete. Besides, the decontamination effort would be difficult work, so the air had to be circulated for the comfort of the cleanup workers. The SOB's ventilation system could operate without releasing the air to the outside, but VERSAR's cleanup plan required ventilation to the environment because the stale, toxic air could not be recirculated indefinitely. On August 11, 1981, at a public meeting where officials announced that the tainted soot was about as dangerous as a common, garden-variety pesticide, a VERSAR engineer promised that the vented SOB air would be cleaner than Binghamton's general environment (Fecteau 1981k). "Toward the end of the month of August ," an official history of the SOB saga declares, "the Office of General Services completed an Environmental Impact Assessment in accordance with the State Environmental Quality Review Act. The assessment concluded that the preliminary cleanup of the Binghamton State Office Building would not have any significant adverse effect upon the environment" (OGS 1982, 15). This assessment was necessary before OGS and VERSAR could begin the second cleanup. As noted earlier, there are two ways to conform to New York's Environmental Quality Review Act. The first (which OGS claims to have used) would have required the drafting of an Environmental Impact Statement (EIS). An EIS is not complete, however, without a detailed cleanup plan, replete with risk assessments supporting assertions that the cleanup posed no additional risk to the surrounding community or to the cleanup workers. An EIS also requires that public hearings be held so that interested parties can express their views and directly question authorities about their decisions. OGS did not, contrary to the official history, choose this option. The legal equivalent of an EIS is a "Negative Declaration," which is presumed to have the same consequences as an Environmental Impact Statement. Using the declaration rather than the EIS implies that the procedures described and justified in an EIS would not change under any conditions. An official in New York's Department of Environmental Conservation explained that VERSAR and OGS were "following the intent, if not the letter" of an Environmental Impact Statement. The experts, he said, were reviewing VERSAR's plans, and the periodic public meetings put together by OGS served the same function as the formal hearings that would have been held with an EIS. The DEC official compared the State Office Building decontamination to similar situations in which private companies were involved. In the latter cases, he explained, companies must clean up the property and equipment and prove they are safe for human exposure. An EIS is always required in those cases. In part, an EIS serves to protect workers and the public, but it also serves another purpose. As a DEC official put it, Environmental Impact Statements are "great because they take the heat off us. Any time we have a politically hot topic, we just go through the hearing route, and that takes the heat off" (Lanahan interview, October 7, 1981). But the State Office Building accident was different from typical environmental contaminations in two important ways. In the first place, the official explained, OGS was exempt from obtaining the kind of permit required of a private corporation because the SOB was considered an ongoing emergency, and permits are not required for emergency cleanups. Second, and more important, the SOB was not, for DEC at least, a "politically hot topic." In chapter 3 I chronicled the mechanisms DEC used to buffer itself from the controversy surrounding the accident at the office building. The most important mechanism was defining the enclosed structure as separate from "the environment." Thus, DEC required no public hearings to deflect the political heat. The Negative Declaration asserted that the proposed cleanup would "not have a significant adverse effect upon the environment" (OGS, August 28, 1981, 1). Before an extensive decontamination could be undertaken, as much soot as possible would have to be removed from the SOB. The declaration did not contain formal risk assessments, but it did have a detailed "work plan" outlining the measures to protect the cleanup workers. It also described an air-filtration system utilizing "negative pressure" during the cleanup. Negative air pressure meant that by using fans on the roof air would be drawn through the building from the ground floors up. The fans would pull the air in through doors and vents and then push it through filters on the roof, recirculating the air into the building and sifting toxic chemicals from the good air. In this way, control would be established over the direction of the airflow and, presumably, over the release of contaminants into Binghamton's environment. A Negative Declaration and the more elaborate Environmental Impact Statement both claim to other parties that an organization is making responsible decisions. Both announce that a thorough and rational decision-making process generated their conclusions of safety. They are both formal accounts of an organization's decision that the benefits of some activity outweigh its costs and a signal to other groups that problems are not insurmountable. A Negative Declaration, however, is directed to groups not at risk: organizations. An Environmental Impact Statement is directed toward publics, or to those who presumably will bear the risk of the activity being negatively declared. It would be a similar process for the public, he said: "There is more stuff in the library and papers than they want to read. The key is, first, to get them satisfied that we are doing a good job, and then get them bored, and then go in and clean up the building." The important organizational problem regarding decontamination was creating a structure of authority that would forestall the potential for other bases of conflict—no "loud dissenters"—to arise and challenge official definitions of acceptable risk. The social technology employed for achieving this end was effective. Before OGS contracted with VERSAR, state officials often reacted to criticism in a blunt, unforgiving, and sometimes condescending manner. OGS officials sometimes directed scathing criticisms toward those who challenged cleanup methods. For example, at a public forum, the guard who was on duty in the SOB when the accident occurred asked officials to explain why samples of fat (where toxic chemicals tend to accumulate) were not taken from the exposed people as part of the medical surveillance program. Her question went unanswered. Instead, she was subjected to a tongue-lashing on the dangers of smoking. Creating consensus and inducing public boredom were not likely in such a highly charged atmosphere. After VERSAR began working for the state, official response to dissent took a marked turn. About nine months after the accident, I was told: "VERSAR has done this before and found that people lose interest fairly quickly. Nobody will care at some point if the press work is done right. A few people are still interested in the details of the medical stuff, interested in residual levels around the building, a little interested in the safety precautions in the cleanup, but that is a minor part of it" (anonymity requested). The advent of VERSAR brought a change in the interaction between OGS and its critics. Minor details, rather than the fundamental assumptions of the Office of General Services' decisions, became the focus for discussion. Further, as New York State began to create a structure of responsibility and authority for decontamination, the roles of other, more critical organizations and the public began to be less significant. As with medical surveillance, the reduction of the number and type of actors involved helped to prepare the way for defining acceptable risk. Symbolic Risk: Decontamination or Destruction? There were essentially two alternative solutions to the problem presented by the SOB: clean it up or tear it down. Ridding the structure of the chemicals was a Herculean task, given the vast range of pathways to the goal of decontamination, from removing every bit of soot by scraping, washing, and wiping to gutting the entire structure. Still, officials seemed convinced from the beginning that the building would not be destroyed and that hygienic conditions could be restored. "Once it is decided how clean the building has to be to be safe," said the president of VERSAR, "we will prepare complete engineering specifications for the cleanup" (Fecteau 1981j). Several months after the accident, VERSAR's president estimated that it would cost between $45 and $55 million to tear the building down and replace it, and added, "I don't think that will be necessary. I think we can come up with a plan to clean it. But the first thing to do is to establish how clean it has to be" (Fecteau 1981j). Similarly, the cleanup engineer declared three days after the fire that the building would probably be closed only another ten days (Fecteau 1981b). The commissioner of OGS reflected his organization's commitment to decontamination on September 10, 1981: "I wouldn't retreat on any of the things we did, but our public relations did slip.... I'm thoroughly convinced we're going to clean it and get it opened, and that's not Pollyanna talking.... I can't be a doom and gloom guy. I've got that much confidence in this country" (Fecteau 1981l). Implicit in all these pronouncements was the unfailing faith that the SOB could be cleaned, that it must be cleaned and reopened, and that the notion of taking the building apart and carting it away was ludicrous. Yet there was little objective evidence on which to base this conviction. Because the accident at the SOB was unprecedented, there was no way to be sure the building could be cleaned. Because there were no legally established safe levels for dioxins (for example, by EPA or OSHA), there was no way to be sure acceptable levels could be reached. Even if safe levels could be defined, there would still be no predictable end to the amount of resources the project would require before the building would be usable. These organizations implied that they would "stop cleaning the building when it is clean." But this, surely, is a platitude. Our theories lead us to believe that organizational behavior is goal-directed and that behavior not so oriented is nonrational. One of the panel experts warned state officials that a decontamination attempt without a clearly defined end would lead them into an abyss of ambiguity: "You are faced with a monumental decontamination task," he cautioned, "which, unfortunately, has the potential for becoming an albatross around the neck of the New York Department of Health for many years to come.... However, decontamination efforts are pointless unless you have a goal-oriented program. Thus, interim standards must be established concurrent with decontamination actions, lest you be faced with the dilemma of when to stop cleaning" (A. Young to Haughie, May 7, 1981). If we think of the decontamination process in operational terms, the cleanup seems like a twist on Karl Weick's argument that organizations often do not know what their goals are until they have acted (1979). That is, when explanations were demanded from state officials for their actions, the goal of "cleaning until it is clean" was easily produced. But with no available levels of acceptable risk, or levels of contamination, toward which the cleanup could be directed, the Office of General Services was not pursuing "a goal-oriented program," as the expert put it. To better understand these behaviors, consider the disadvantages posed by the destruction of the SOB, as opposed to its decontamination, from New York State's point of view. In interviews, I often asked officials why they did not simply tear the building down and bury it in some landfill. Unlike decontamination, this solution would indeed be final. (Moreover, there was a precedent. In the early 1970s dioxin-contaminated portions of a chemical plant in the Netherlands were encased in concrete and dumped in the sea near the Azores.) Policymakers replied that they had no choice in the matter. The building, they explained, could not be dismantled because doing so would expose the contaminated interior to Binghamton's environment, thus releasing the toxins. Therefore, toxic levels within the building would have to be at least as low as ambient levels before the State Office Building could be destroyed. And if the levels could be lowered to those outside the SOB, the building would, for all practical purposes, be decontaminated, and might as well be reopened. There are several flaws in this reasoning: First, the building was never airtight. Locking most of the SOB's doors, restricting access, and preventing the roof hatches from opening undoubtedly prevented some toxic chemicals from escaping. But a VERSAR engineer told me that outside air was exchanging with the air inside the SOB every twenty-four to thirty-six hours; i.e., Binghamton's environment was already contaminated. Second, the building could have been gutted, leaving only the structural steel and outer walls, neither of which was contaminated by the toxic soot. Although gutting would have disturbed the soot more than cleaning would have, the contents of the building could have been sealed before being taken out. Finally, OGS and DOH had long ago abandoned ambient air levels as an acceptable goal of the cleanup (such a level for dioxin would probably be zero). Thus, there were few practical reasons not to destroy the building and replace it. At the same time, given the uncertainties and difficulties of determining the long-term effects of exposure to toxic chemicals, few independent experts would be willing to testify in a courtroom that a case of cancer or a malformed child could not possibly have been caused by a residual molecule of dioxin or PCB left in the building. As one DOH official said, "It's impossible to remove every molecule of PCB. After decontamination there will be PCBs at levels above those at the time of the explosion" (Fecteau 1981e). It is not hard to imagine a jury—faced with persuasive arguments from medical and legal experts and with a deformed child or a cancer-ridden mother of three—finding in favor of a complainant. (Chemical companies frequently settle out of court, even though statistics support their cases, because of the plausibility of this scenario.) Given the plethora of excellent reasons to destroy the building, how is it possible to explain the state's determination not to do so? The way to understand the behavior of state organizations is not to focus exclusively on defining safe chemical levels. Instead, the decision to decontaminate rather than destroy the SOB may best be understood by looking at the environment of OGS. Government officials for Binghamton and Broome County, for example, shared the state's commitment that the building could and should be cleaned; the expert panel seems not to have considered destruction a viable alternative; and NIOSH, the state health department, even the media, almost always couched their recommendations, criticisms, and comments in terms of the difficulties, or inadequacies, of cleanup attempts. But no group in the environment of OGS ever forcefully pressed the possibility, or the desirability, of destruction. In addition to the lack of external pressure, internal forces at OGS served to defeat the alternative of destruction. From the first few days after the accident, various government officials, from the governor and the commissioner of OGS down to lower OGS functionaries, declared their intention that the building would someday be reopened. It would be imprudent to estimate the moment, but at some point it became impossible for leaders to retract their convictions of certainty, claim that enough had been learned, and begin a project of destruction. I am not speculating about the motives of New York's policymakers; nor am I making any assertions about elite personalities. Rather, I am suggesting that a process of commitment to a course of action occurred, wherein promises were made or implied without knowing how those promises would be fulfilled. If organizations say loudly enough and long enough that they are going to do something, they can create a situation in which that action must follow their proclamations (Salancik 1977; Staw and Ross 1978). Another part of the reason the building was cleaned was the potential political costs of destruction. As one OGS official explained: "The building is not a free-standing building. It's part of a complex. The city, county, and state share the plaza. But to have launched the demolition of the largest building in the place would have caused additional damage to the surrounding areas. And I don't know what the political implications would have been in terms of making that judgment" (Rings interview, December 4, 1984). Finally, New York State has had its fair share of well-publicized "toxic time bombs." These include Love Canal, PCBs in the Hudson River (DOH advises pregnant women not to eat fish from the river), Hyde Park, and the widespread contamination of Long Island's potable water. Science and effective organizations are expected to be able to handle problems without resorting to radical solutions. Destroying the office building in Binghamton would have effectively announced that problems of toxic chemical contamination can be beyond expert abilities. Eliminating, rather than rehabilitating, the SOB would have supported a risk assessment that, in effect, presented the incremental risks to human health posed by PCBs, dioxins, and kindred chemicals as unacceptable. The process of defining acceptable risk requires that some agent, or set of agents, establish a "domain consensus," or a general agreement, concerning a distribution of authority. Without a domain consensus, the definition of acceptability cannot be resolved, because too many discrepant interests, goals, and values are competing for attention. In the context of the State Office Building case, this meant that as long as meaningful dissension persisted among the many actors involved just after the accident, it was impossible to resolve the dilemma of what to do about the building. Before that dissension could dissipate, a stable structure of authority for decisions and allocation of resources had to be organized. The primary mechanism through which that structure was created was the establishment of VERSAR as the official cleanup agency whose word would be more or less final regarding the technical issues. The secondary mechanisms through which dissent was defeated were the state's use of a Negative Declaration rather than an Environmental Impact Statement, and its structuring of debate agendas by assembling scientific materials so that safety rather than jeopardy was emphasized. The Negative Declaration ensured that open and public debate over the dangers of decontamination would not arise. Presenting incomplete evidence to the expert panel and the public without meaningful comparisons to similar situations narrowed the agenda of reasonable alternatives. This process was not fully rational. For the decision-making process to have been completely rational, state officials and organizations would have had to array a fairly complete set of options (from doing nothing to complete destruction), evaluate each one of them on a number of dimensions (cost-benefit analyses that dealt with a wide range of values), and choose the one that maximized as many values as possible. Clearly, no alternative other than decontamination was seriously considered by the state, even though there were very good reasons to demolish the building. Thus, the process of organizing the decontamination of the State Office Building was decisively shaped by organizational interests, the bounded rationality of decision makers, and the social environment of their organizations. The main conclusion of this chapter is that uncertain and unstable social conditions prevent organizations from defining acceptable levels of risk. Before I pursue the implications of this conclusion more fully, another set of actors in Binghamton needs to be heard: those who considered themselves victims of exposure. Note 1: Various sources reported that air samples averaged 1.48 ug/m3; that the highest surface concentration was 1995 ug/m2; and that the average on horizontal surfaces was 162 ug/m2, and 6.76 ug/m2 on vertical ones (PCB contamination in closed file cabinets averaged 74 ug/m2 New York Department of Health, February 24, 1981). As a proportion of chemical to soot, PCB was found at 100,000 ppm (OGS, August 4, 1981); PCB was also found to be 10 percent to 20 percent of some samples. Furans were found at 2610 ppm (Rappe to Haughie, June 1, 1981), and 756 ug/g in soot samples (Stalling, March 31, 1981). Apparently, there were no early attempts to measure airborne dioxins, but they were found to be 24 ppm in samples of soot (Smith et al., February 20, 1981). Back. Note 2: It is clear from internal documents and interviews that destruction was considered by state organizations. Back. Note 3: The original members of the panel included Richard Dewling, acting regional administrator, EPA; Donald Grant, acting chief, Toxicology Research Division of the Health Protection Branch of Canada's Health and Welfare Department; Douglas Harding, senior medical consultant, Ontario Ministry of Labor in Canada's Special Studies and Research Branch; Clark Health, director, Bureau of Chronic Diseases at the CDC; Renate Kimbrough, research medical officer, CDC; Philip Landrigan, director, Division of Surveillance, Hazard Evaluations, and Field Studies, NIOSH; John Moore, deputy director, National Toxicology Program, and associate director, National Institute of Environmental Health Science; David Stalling, chief chemist, U.S. Fish and Wildlife Service; Robert Tardiff, executive director, National Academy of Science's Board on Toxicology and Environmental Health Hazards; Arthur Upton, head of environmental medicine at New York University Medical Center; David Wade, Division of Epidemiology, Michigan Department of Public Health; and Alvin Young, Major, U.S. Air Force. A large packet of materials was given to the experts at the meeting. For convenience I cite materials from these documents as Panel Packet, April 3, 1981. Back. Note 4: All quotes in the remainder of this section are taken from the report in Smith et al. (February 20, 1981) unless otherwise noted. Back. Note 5: Cystitis is inflammation of the urinary bladder; hemorrhagic means bleeding; nephritis means kidney inflammation. Back. Note 6: See Whiteside (1979) for evidence of more damage. Back. Note 7: For an argument that Environmental Impact Statements are a mechanism of political accountability, see Taylor (1984). Back. Organizations and modern technology give us much of what we value, but they have also given us Chernobyl, Three Mile Island, and Bhopal. The question at the heart of this paradox is "What is acceptable risk?" Based on his examination of the 1981 contamination of an office building in Binghamton, New York, Lee Clarke's compelling study argues that organizational processes are the key to understanding how some risks rather than others are defined as acceptable. He finds a pattern of decision-making based on relationships among organizations rather than the authority of individuals or single agencies. Lee Clarke is Assistant Professor of Sociology at Rutgers University.